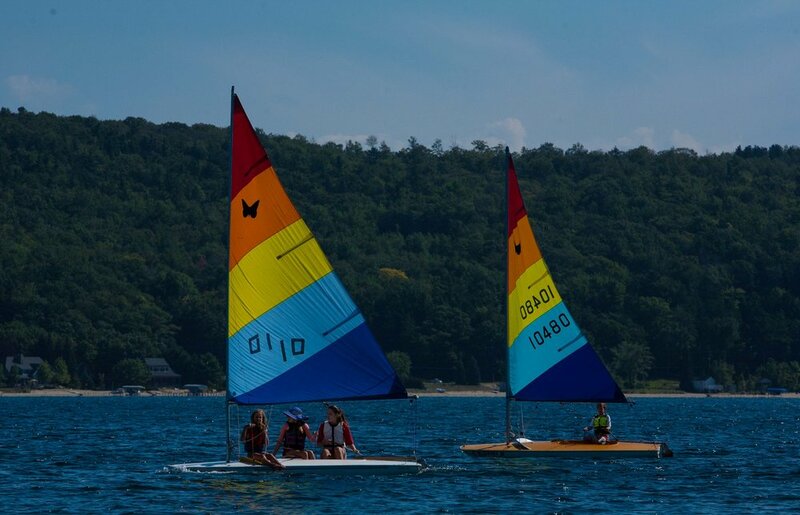 Butterfly Learn To Sail is designed for novice sailors who are too old to fit comfortably in an Opti and kids of any age who are ready to train on a larger and more complicated boat. Novice sailors will learn the basics of sailing, sailboat maneuvering and right of way, and, when ready, how to recover from a tip-over, sail upwind to the windward mark, and complete controlled tacks and jibes under a variety of wind conditions. Intermediate sailors will continue to build on their sailing skills, with special emphasis on techniques that safely maximize speed in a more sophisticated boat. Days of the week: Classes run weekly 6/17-8/9, Monday - Friday (rain or shine). Note the special schedule for the week of July 1. Classes will meet on Monday, Tuesday, Wednesday, and Friday from 9:30 - 12:30. All students are invited to march with us in the Frankfort Parade on July 4. This class will NOT be offered the week of July 15th, because of Butterfly Nationals. Restriction: Recommended for novice sailors ages 12 and up and intermediate sailors of all ages. E-mail us if you want to register a kid younger than 12 for Butterfly Learn to Sail.